French scholar; flourished in the first half of the twelfth century. He is quoted in an anonymous commentary to Chronicles, written at Narbonne before 1140, as having given the author verbal explanations of various verses—I Chron. ix. 39; xviii. 3, 5; II Chron. xxiv. 14 (see Zunz, "Z. G." p. 73). Zunz ("Literaturgesch." 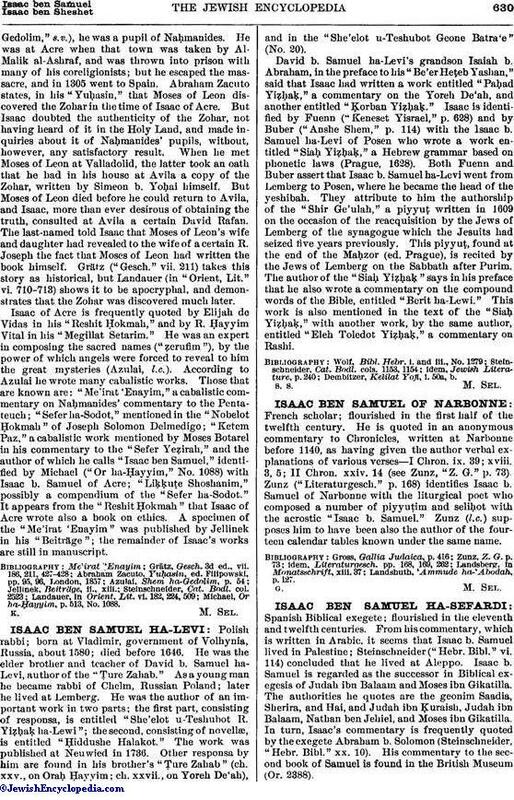 p. 168) identifies Isaac b. Samuel of Narbonne with the liturgical poet who composed a number of piyyuṭim and seliḥot with the acrostic "Isaac b. Samuel." Zunz (l.c.) supposes him to have been also the author of the fourteen calendar tables known under the same name.